Okay I worked up some Urbanos Sector details and thought I would share. The extremely high population world of Urbanos is located in the lower Orion Arm spur of the galaxy. It has an enormous population, well over 100 billion people and is technically a city-planet, with the entire surface covered with one gigantic stprawling city. Urbanos, along with the other Big Four, have built up a large alliance of planets, the Oceanic Alliance and is extremely high tech, the Minervans and the alien Bushi race are above tech level 18, making the Alliance extremely powerful. Unfortunately, it is also under attack, from two different directions by two completely sperate enemies. 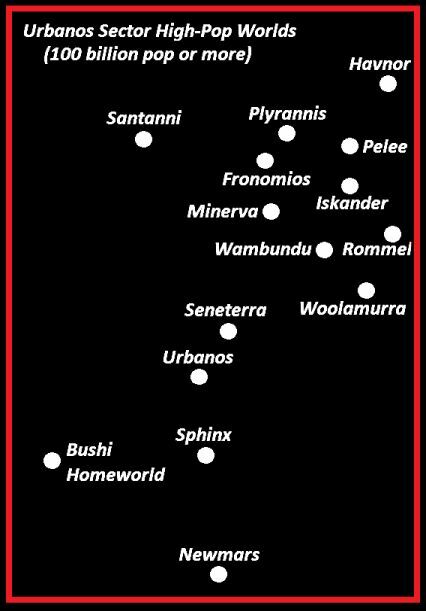 For now, here is a map showing the largest populated planets in the Urbanos Sector.